Fort Myers, FL – Polygon Solution’s Rotary Broach Form Drill is a new tool used to improve manufacturing processes used in rotary broaching. Rotary broaching is a machining technique used to create hexagon and square holes in metals and plastic parts such as custom aerospace fasteners, orthopedic bone screws and hydraulic fittings. The new form drill is used to drill the pilot hole needed before the rotary broach can shape the hole. The form drill is appears to look like a common drill, however three innovative features make it much more valuable. The first feature and most important dimension is the pilot hole diameter. Optimal pilot hole dimensions for rotary broaching are about three percent larger than the flat-to-flat dimensions of the hexagon. 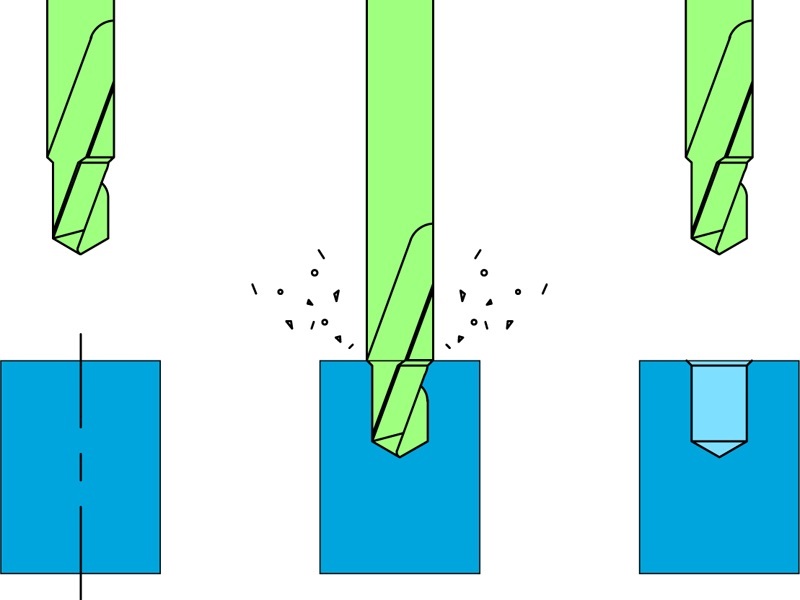 (see figure 1) The oversize pilot hole makes individual chips curl into the hole, and reduces the amount of material to be removed when broaching. (see figure 2) The smaller amount of material to be removed also reduces the amount of force required by the machine to push the broach into the hole. The second feature of the form drill is the chamfer created by the drill’s profile. 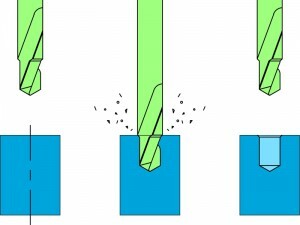 The chamfer at the opening of the hole is critical to rotary broaching because it allows the broach to easily start curling a chip at each corner of the hexagon. Typically, the chamfer has to be created by a second cutting tool. The rotary broach form drill thus eliminates the second tool from the operation in the machine, freeing up a machine tool position and cutting tool inventory. The third feature of the form drill is the depth. The depth of the form drill is predetermined at about one and a half times the flat-to-flat dimension of the hexagon. Because most hexagons are broached to a depth of only one time the flat-to-flat dimension, the extra depth is used to allow chips to curl up inside of the hole without interfering with the broaching operation. Chips from soft materials like aluminum and mild steel easily compact into the hole. Chips can also be removed after the operation using the form drill if desired. The predetermined depth eliminates programming and set-up time. Polygon Solution’s innovative from drill can be used to eliminate pilot hole depth and diameter calculations, additional chamfering tools, cutting tool inventory and valuable tooling positions. Form drills can be purchased with matching rotary broaches to simplify tool ordering and inventory. This lean manufacturing tool is a must for high production hexagon and square hole manufacturing. Polygon has already begun stocking form drills to match standard English and metric hexagon rotary broaches. Form drills for standard square sizes will be available in early 2013, and custom sizes can also be ordered. Custom size form drills may be helpful when manufacturing serration, six-lobe and spline shaped holes. 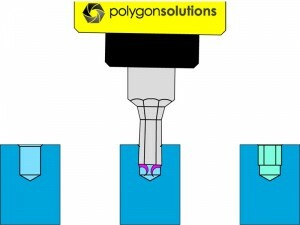 Polygon Solution’s rotary broach form drill is part of an innovative product line continuing to evolve since Polygon released their GT Series Rotary Broach Tool Holder in 2010. Polygon is a winner of the ML100 2012 Manufacturing Leadership award for Innovative Enterprise. The company’s other recent rotary broaching innovations include the Rotary Broach Brake and Letter Broach released earlier this year. The rotary broach form drill is the first innovation from the company to focus on lean manufacturing.